If you have developed web based application by using laravel framework, then you have to need to give one feature like delete or remove multiple records by using checkbox with ajax in your laravel based web based application. By using this feature user can easily remove multiple or bulk un usable data in a single click and this type of feature will save user time for delete data one by one. This all operation will be done without refresh of web page because we have use ajax for this things. So, in this blog we have discuss how to remove or delete multiple mysql table data with checkbox by using Ajax in Laravel application. If you want to remove single records then you can also use this feature by selecting only single records. In our previous post we have already covered how to delete single records by using Ajax in Laravel. 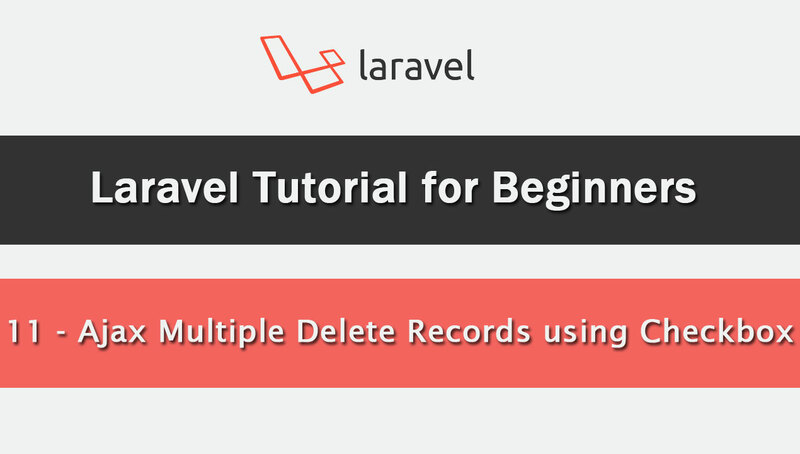 So, many reader has requested us to make this type of tutorial like how to remove or delete multiple data by using Ajax with Checkbox in Laravel. In our previously post we have already loaded mysql table data in Yajra Datatables package. So we have use same code here with Add new data with edit and delete button for this we have to go to resources/views/student/ajaxdata.blade.php file. Under this First we want to add one button for delete multiple checked checkbox row. After this we have we have register new column into jquery Datatables code. Dyanmically checkbox each row code will be generated at AjaxdataController.php file. And lastly in this file we have to write jquery code on bulk delete button which we have created lastly. Whole view file code you can find below. Now we want to go to app/Http/Controllers/AjaxdataController.php file and in this file we have write code for generate dynamic checkbox for each student row in getdata() method. After this we have create massremove() method for delete or remove multiple data in single click. This method will receive ajax request for delete multiple data based on selection of checkbox. You can find whole controller code below. Lastly we want to set route for newly created massremove() method in AjaxdataController.php file. So, for this we have to go to routes/web.php file. And in this file we have set route for massremove() method. So, this is complete source code for how to delete or remove multiple or bulk records or mysql table data by using checkbox with Ajax in Laravel. This feature is very usefull in enterprise level application. For know complete flow of code please see video tutorial of this post on Webslesson youtube channel.